The CryoSync™ *(patent pending). 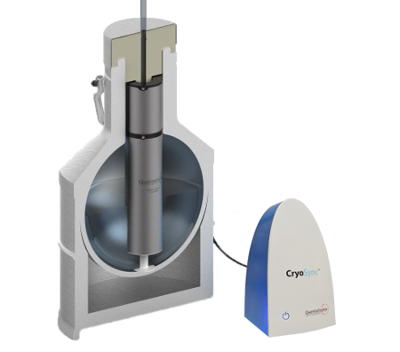 The CryoSync ™ is a compact and cost effective cryostatic accessory designed to provide precise temperature control (±0.005 K) at temperatures in the range 82 – 120 K. The CryoSync™ is ideally suited to enable 3P micro 300 and other physisorption analyzers to generate fast and IUPAC-recommended micropore analyses using argon (Ar) gas at 87 K and liquid nitrogen as the cryogen. for as long as needed for extended high resolution analyses (over 50 hours without optional refill). There has been a long-felt need in the art for the means to enable Ar @87K experiments without having to resort to using compressor-based cryostats (which can be very expensive) or liquid argon cryogen (which can also be relatively expensive or even unavailable in some regions). The CryoSync™ fills this need by providing a compact accessory which is easily adaptable to modern gas sorption analyzers. With the CryoSync™ users can easily perform IUPAC-recommended argon sorption analyses at 87.3K using liquid nitrogen (instead of liquid argon) as the cryogen.